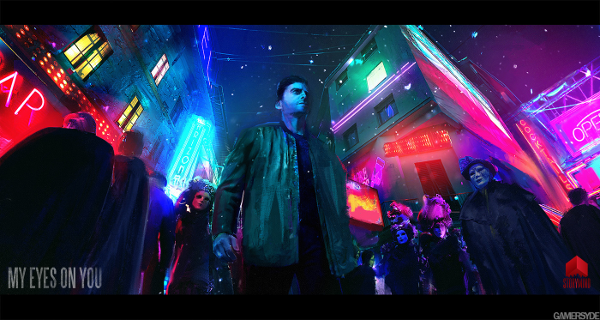 With a reality that changes in response to in-game decisions, Storymind Entertainment’s My Eyes On You takes third-person 3D mysteries in a unique direction, dropping players into an alternate-reality Chicago filled with carnival culture and murder. With development pushing ahead, I chatted with the team on the project and their content creation process. 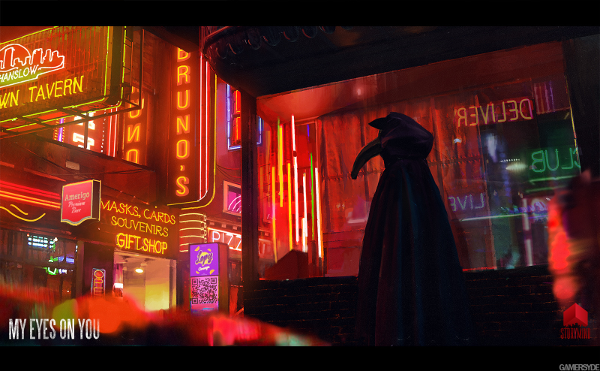 Erik Meyer: Within the context of your project, how do you see the neon-noir environment contributing flavor and richness to the world you’re creating? From your developer POV, what aesthetics cut to the heart of the game? Val Daniels (Game Director): You’re obviously right about the meaning of color, light and shadow in the game. We don’t just show neon and the city full of light because they are beautiful. Play of light and shadow is the explanation of how the alternative world of Chicago works. The city has a lot of lights, but most places in it are covered in darkness. The most important events in it happen in darkness, where no one sees them. Neon lighting is just a shop window for what’s happening in darkness. People in the universe of My Eyes On You wear masks of different shapes, colors, and meanings as a part of their regular outfits. They emphasize both their fashion and their moods or intentions by wearing certain masks. 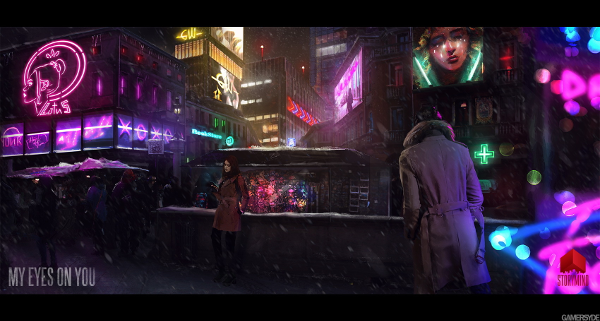 People in the city live a double-life, with and without masks. Carnival Man in his crimson mask confronts exactly this aspect of the city’s life. His thugs get introduced in white masks of the same shape and pattern, and they are very honest about the fact that they are the bad guys. And the public condemns them externally, but everyone understands internally that the thugs are more honest than a regular city resident. We introduce this contrast between internal and external, between real and fake, by the light-and-shadow play to emphasize this dissonance. EM: The story takes a grounded or a mystical direction, depending on the choices the character makes throughout the game. From a game asset and play mechanics point of view, what kinds of challenges has this presented to you as developers? Val Daniels: There are two issues at least that come to mind first: coding the grid of possible choice outcomes and narrative branching. Coding of extensive grids for choices and their outcomes has a propensity to lead to ludicrous results in gameplay. Let’s say you need to process 5 clues to get to the next chain of crime investigation. You crack 4 and in 1 you fail, resulting in failing the whole objective; now your investigation halts because of one wrongly processed clue. In a real investigation, that wouldn’t happen. Large narrative branching leads to an almost infinite amount of storylines. The “right” amount of storylines is hard to manage, and we have to work hard to make a game with diverse choices, enough storylines, and not to go to extremes with that. This is a serious challenge. EM: I’m seeing a wide variety of masks in the characters who inhabit the game world, so can you speak to the varied motivations for concealed identities and alter egos in My Eyes On You? It makes sense why thugs robbing a bank would disguise themselves, but I get the sense that there’s more at work here, what with carnival culture and Carnival Man at work. Val Daniels: It is indeed so. It’s not as much about thugs disguising themselves, as much as it’s about the people of the city trying to disguise their private lives, which are full of controversy. Say a person who is the president of the class in school and shows excellence in everything works as a prostitute for the important people of the city and does so in a mask so no one could identify him. So do important people. All of them call it their private life, and they think they should protect it by hiding it. Thugs are just always in the same masks and are very clear about their motives. This is where confusion arises, because the people of the city are not as honest in their motives as the thugs are. EM: Stressful situations can cause hallucinations, and the game changes based on the actions of the player, so from a writing standpoint, what do you feel you need to do to maintain a consistent world view for gamers? As developers, do you feel the need to address concerns that an unreliable narrator will cause players to dismiss things too easily, or do you simply focus on having each experience, real or hallucinated, feel concrete and visceral? Matthew Moffitt (Writer): In order to maintain a consistent worldview for the gamer, the players must always be with Jordan on his journey, never ahead or behind. My Eyes On You is a tale about Jordan’s journey through this alternate version of Chicago as it becomes this crucible for his character and fortitude. We are with him for the ride. The player has to believe in him, trust him, and when Jordan becomes confused or disoriented, we also become that way. Thus, when our hero inevitably faces these crippling hallucinations, we find ourselves just as puzzled as Jordan. What’s happening? Who is responsible? And is there anything we can do to stop it? In the end, it is not so much a concern for me as the writer that the player perceives Jordan as unreliable at times, but rather when they begin to doubt his character: If the player stops believing in him, then the impact and message of MEOY is lost. 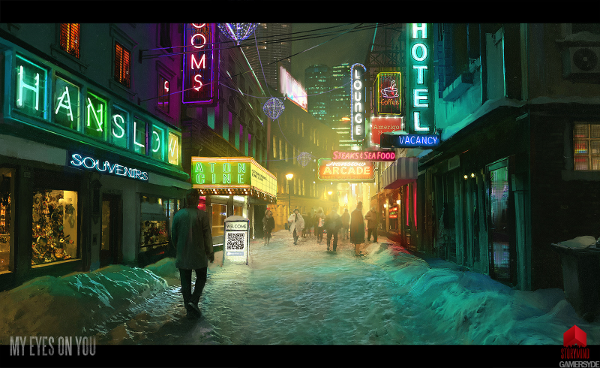 EM: I can’t help but notice the thug picking up Ray Bradbury’s Something Wicked This Way Comes in the announcement teaser you released, so without placing too much emphasis on that single detail, I’m curious about the literary quirks and genre nods players can expect from the game. Your studio speaks to engaging storytelling on its website, so give us a window into the creative grounding of the project and the canon it leans on. Val Daniels: Ray Bradbury’s book is written in a horror genre, but that’s not to say we’re making a horror game. Our game is a drama/tragedy, but the experience Jordan goes through is an utter nightmare to him. Sometimes his fears paralyze him so much that he stops thinking rationally and his life becomes a living hell. Mr. Dark in “Something Wicked This Way Comes” is the main subject to fear. Jordan is considered to be the darkness of the city by the citizenry. He’s trying to identify this darkness in himself. 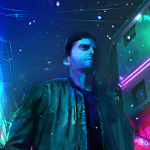 Then he realizes that beautiful neon-lit world he always wanted to be a part of is a real darkness, and that is a catharsis of the story that I can’t talk about right now. b) pay a high price for trying to live differently. Through such a change in all key characters, we wanna speak to people about things they feel and know, and cannot talk about, and we are sure that revelations in the game will strike the player’s stance on their own values as individuals. That being said, I can’t overemphasize the importance of the personal story in games. There are very few games like that, so it’s hard to compare us to anybody in storytelling. The Last Of Us made a great personal story of two people who learn to love again and how one should fight for love. On our side, we’re attempting to challenge players on the issue of what defines their principles, themselves or external circumstances. Not an easy task, that I can tell you. EM: Each developer has a different workflow and process, so let me in on Storymind Entertainment’s way of doing things. What does a typical day look like, and how do all the different moving parts get assembled? When it comes to tricky content decisions or tough calls, who has the final say, and what kinds of group dynamics help push things along? Val Daniels: We’re currently working remotely. We have no office. We occasionally pick a place for team meetings though, setting up the goals and drawing conclusions out of the results we’re getting. We mainly use chats to work together as a team. We have departments, each responsible for its range of work: 3D, Characters, Animation, MoCap, Programming, FX, Communications department, etc. The Creative Department is responsible for deciding what content we shall see in the game. I, Tony (Art Director), Matt (Writer), and Danny (Game Designer) are driving that department. Our biggest one is 3D. A good half of the team works in it, as we need a lot of models 🙂 The biggest challenge for the project currently is animation. Ukraine has few great animators who work with game engines. So any good game animator who can do realistic animation is welcome to join our team! As far as the production plan goes, I go to Matthew and he picks a story and location at which the story unfolds. Then Danny picks it up and does narrative design and level design. Then 3D artists begin to make assets for the level. If 3D characters are ready, I need to throw a motion capture session (we rent MoCap at the Film.UA studio in Kyiv). I direct our actors on stage. After the mocap and a clean-up, animating the characters should take place. After that, we test newly done animation with game mechanics that our programmers did months ago. And this is pretty much what our production routine looks like. There are two producers at the project: me and Tony. We have a final say in what is in and what is out. But we give our teammates a large space for creativity, so in the aftermath, pretty much everyone had a chance to explore their ideas. Every person that contributes to the creative process understands the setting, too. That’s why most ideas from the team end up being in the game concept document. EM: From a strictly geographical standpoint, why Chicago, as a setting? What draws you to the Windy City, and how does the historical backdrop of Illinois corruption add depth? Selfishly, are we going to see anything like the Blue Line or other, more nuanced, landmarks? Val Daniels: Chicago is overgrown by legends and facts in its criminal history part. Even a recent spike in crime is another indicator for it. Second of all, Chicago is the capital of noir films. And still there’s more to it. Chicago has had a series of Italian immigration waves which brought Italian criminal gangs along with the normal folks into the city. This is the basis of our alternative version of Chicago. In the universe of My Eyes On You, Italian carnival culture has a bigger impact on the local culture than in the real place. Nevertheless, player will have a good chance to see a lot of unique Chicago locations, including Navy Pier, the Blue Line, etc. EM: What are your views of the current indie game release environment and the options for small studios, and how do you see this changing in the future? What tools have made development easier in the last few years, and what kinds of software would speed things up? Regarding platforms for game distribution and the importance of social media, what do you see as must-dos and hurdles? Val Daniels: It is a complex one. There is a desire to show top-notch environments. Many independent teams have actually accomplished a lot in that area. As the record shows, software is not an obstacle towards the goal of a AAA-looking game. I will go ahead and say the bigger problem for independent developers does not lie in the area of production. If you look at most teams, you will see that they usually consist of 2-5 people working in the production. As these developers often admit themselves, the problem is in lack of qualified people who can take development to the next level. And it happens not because there’s not enough professionals on the market, but because project leads actually don’t ask outsiders to help in the needed degree. Fear to negotiate with professionals is the biggest issue. Most developers think that pros will want a lot of money up front, but a few of them will agree to be paid a bit later, if they believe in what you’re making. This is the problem for most independent developers, not the software. I dare developers to have courage and sell their pitches to big professionals. You will be surprised by your results. As for the media, I think doing marketing on your own is not a good strategy. Spending time learning how social media marketing works while you’re busy developing your game will drain you. I’d recommend hiring a game PR agent who knows how to do it. The cost is humble for an indie budget, but it is absolutely worth it, and you will spend time on production, at the same time learning game dev marketing from what your agent does. I strongly believe this is the best strategy.